Richard Deacon is part of the post-war generation of British artists reacting to the now-classic works of pre- and post-World War II British artists Sir Henry Moore, Sir Anthony Caro and Barbara Hepworth, who dominated European art at the time. With fellow artists Tony Cragg, Sir Antony Gormley, Anish Kapoor, Alison Wilding, Richard Long, Bill Woodrow and Richard Wentworth, Deacon shaped a new vocabulary to reflect the changed reality of the world. Because of his wide-ranging material experimentation, his work is less “recognizable” for a style or practice than many of his peers. His constant experimentation empowered younger artists to think beyond a single gesture and to grapple instead with the many moods of the physical world. Deacon borrows imagery from the workshop, nature and the constructed world around him. The artist calls himself a “fabricator,” experimenting with a range of traditional and non-traditional fine art materials, from laminated wood, stainless steel, corrugated iron and polycarbonate to marble, clay, vinyl, foam and leather. Deacon embraces the material quirks of each to drive the form. In Big Time we can trace Deacon’s interest in juxtapositions: flat versus round, manufactured versus hand-applied. 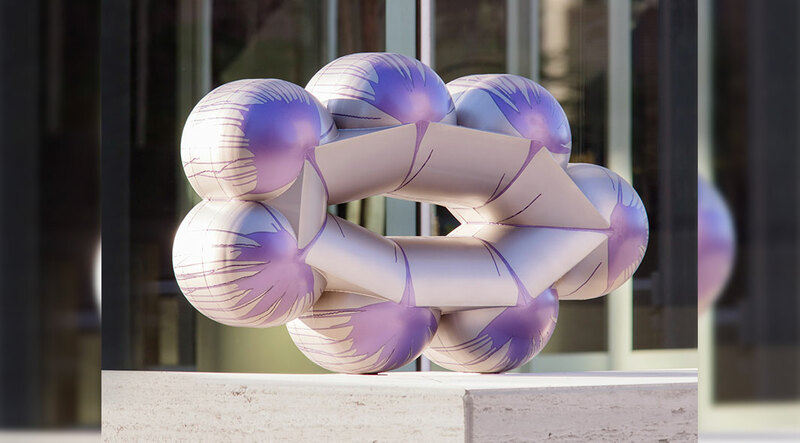 Gravity and time are Deacon’s partner in this piece, the blotches of purple paint dripping from each bulbous end and meeting in the middle of the lozenge-like forms. This work is playful, reminiscent of real objects in the world, but through scale and material, this work shifts how our bodies and minds respond to it, and to the urban environment around it. Richard Deacon was born in Bangor, Wales in 1949 and lives and works in London. He has a BA from St Martin’s School of Art, London, 1972, and an MA in Environmental Media from the Royal College of Art, London, 1977. Solo exhibitions include Museum Folkwang, Essen, Germany, 2016; Kunstmuseum Winterthur, Switzerland; 2015; Tate Britain, London, 2014; Sprengel Museum, Hannover, Germany; 2011; Musée de la Ville de Strasbourg, France, 2010; Portland Art Museum, 2008; PS1 Contemporary Art Center, New York, 2001; MACCSI, Caracas, Venezuela, 1996; Whitechapel Art Gallery, London, 1989; and the Museum of Contemporary Art, Los Angeles, 1988. He represented Wales at the Venice Biennale, in 2007, and has participated in the Venice Architecture Biennale, 2012; the Glasgow International, 2006; and documenta 9, Kassel, Germany, 1992. He won the Turner Prize in 1987 and the Robert Jakobsen Prize, Museum Wurth, Kunzelsau, Germany in 1995. He was awarded the Chevalier de l’Ordre des Arts et Lettres by the Ministry of Culture, France in 1996, and made a Commander of the Most Excellent Order of the British Empire [CBE] in 1999. Book a Stay in Milwaukee with FREE Parking! Sorry! There are no events scheduled that meet the selected criteria at this time. © 2019 - Sculpture Milwaukee. All rights Reserved.